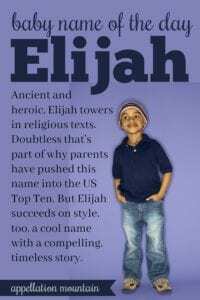 Elijah keeps climbing, a Biblical powerhouse not far behind Noah, and one of my picks for cool boy names in the Top 100. Thanks to Saranel for suggesting her son’s name as our Baby Name of the Day. The top boys’ name in the US has changed, cycling from John to Jason to Jacob and now Noah and Liam. But regardless of the name at the top of the list, Elijah has always charted somewhere in the Top 1000. Ancient and religious, the name figures in the Old and New Testaments, as well as the Quran. It comes from a phrase meaning Yahweh is my God. International forms abound. There’s Elias and Elia, Ilya and Elian, some of which are heard in the US, too. But back to the original. Back in the ninth century BC, the prophet Elijah performed astonishing feats. He even raised the dead. For his efforts, he was rewarded by riding up to heaven in a chariot drawn by fiery horses, or maybe on a whirlwind. Later, in the New Testament, both Jesus and John the Baptist are compared to the ancient prophet. 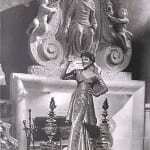 He even makes a cameo, along with Moses, later in the story. One consistent theme? He always insists on the worship of the true God. He features in customs and folk traditions, too. At Passover, Jewish families leave a place set for him at the table. Summer storms, especially thunder, in southern Slavic cultures. Lightning, making him similar to Zeus and other gods. Mountains, especially mountaintops. It was on Mount Carmel that Elijah drew down fire to light an altar to Yahweh, besting the prophets of Ba’al. The sun – in fact, his story is often mixed up with that of Helios, the Greek sun god who pulled his chariot across the sky to start the day. Cher gave the name to her son with musician Gregg Allman way back in 1976. He’s now a musician, too. More recently, there’s actor Elijah Wood, best known for his role as Frodo in The Lord of the Rings movies. On the fictional side, Isaac Asimov used the name for a detective in his Robots series. And The Vampire Diaries, plus spin-off The Originals, includes a major character, part of the Mikaelson family, who answers to the name, too. In both cases, the name works because of its long history. The vampire was first born sometime in the late 900s; Asimov’s detective tale takes place three thousand years in the future. Given the name’s long history of use, it’s plausible that Elijah could be heard in both circumstances. When I wrote the first version of this post in 2012, I asked if the name could crack the Top Ten? That answer turned out to be yes. In 2016, the name reached #9. By 2017, it stood at #8. Elijah first appeared in the US Top 100 way back in 1995. Why so popular today? I think it’s simply the age for softer boy names. We’ve embraced -a endings and longer, elaborate choices. If an earlier generation answered to Bob and Tom, today’s boys are Isaiah and Oliver and Sebastian – longer names, with a certain liquid, flowing style. It helps that we’re wild for El- names, too. While we tend to think of all those girls named Ellie and Ella, the boys’ Top 100 includes Eli and Elias, too. For Old Testament strength combined with modern sound, this name feels like a winning choice for a son today – though one that many parents have embraced in recent years. Would you consider Elijah for a son? This post was published originally on February 23, 2012. It was revised substantially and re-posted on July 25, 2018. 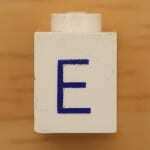 I adore the name Elijah, but could never use it because our last name is practically an anagram of it, and the close repetition of those soft sounds comes out sounding very garbled. Would love it on anyone else. LOVE this name! Who cares if it is in the top twenty! I know plenty of Michaels and Jacks, and none of them seem to be fazed by the fact there a million others out there! I love Biblical names and I adore Elijah. I love his story, how important he is to all 3 monotheistic faiths, and especially his meaning. I don’t know if it’s because of the Boardwalk Empire connection but I prefer Elias. I think I’ve said this before but I know two sets of brothers named Elijah and Isaiah, one group lives just down the street from me (8 and 10 year olds I think). I love it! I know a sub set of brothers named Elijah Benjamin, Isaiah Ephraim and Samuel Levi. 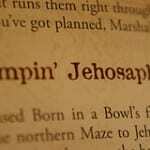 I like the biblical power house names! Elijah is not my style. It’s to do with the ending – whether it is pronounced zhah or jah it just doesn’t appeal to my ears. I do very much like the nn Eli though and Elias would definitely be my personal pick over Elijah. I’m struck by the similarity of Helios and Elias and the co-mingling of religious beliefs. (I really like the unifying nature of Elijah – being an important figure in so many religious traditions and not just associated with one in particular). I have the same issue. I would probably just use Eli. There are approximately a bajillion Elijah’s near and around my neighborhood. What a pity that it took off like it did and likely caught a lot of the parents by suprise. We named our son Elijah (he was born in July 2010) because we LOVED the name and neither my husband nor I had never, ever come across another Elijah in our lives. (Which was a big deal because Biblical names are really, really popular in our circles of friends and acquaintances — many of whom have large families.) And then, afterwards, we learned that our son’s name was in the Top 20 and couldn’t believe it! We still love the name, but it was a bit saddening to realize that he’s not as original as we thought it was. However, I’ve only come across a couple other Elijahs since then. I like Elijah — I always have. Sadly, I’m not alone in this preference, which means that there will be no Elijah in this family! I like its sound, but its popularity is a killer for me. I much prefer Elisha these days, super similar, but nowhere near as popular. And yes, Elijah is definitely heading for the top10, if not this year, next year for sure.